The first big surprise of the summer came during a routine trip to the Two-Guys department store, where i discovered that a new set of 3-Bags of Modern Comics had been released. 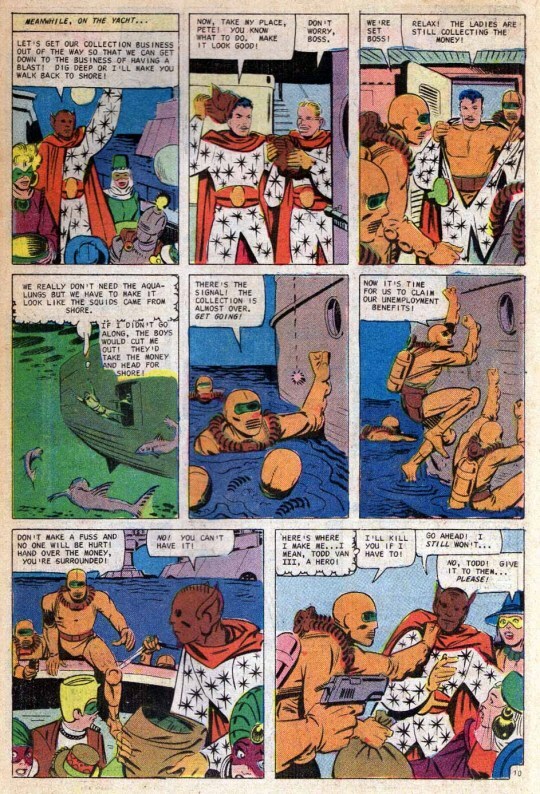 Modern Comics were cherry-picked reprints from the Charlton back-catalog. I didn’t quite realize this at the time, I just knew that there was something odd and interesting about them. So over the summer I once again purchased as many as I could, focusing primarily on the super hero titles. I had previously gotten BLUE BEETLE #3 some months earlier, as well as CAPTAIN ATOM #84 which included a Blue Beetle back-up story. This time out, though, I scored BLUE BEETLE #1. 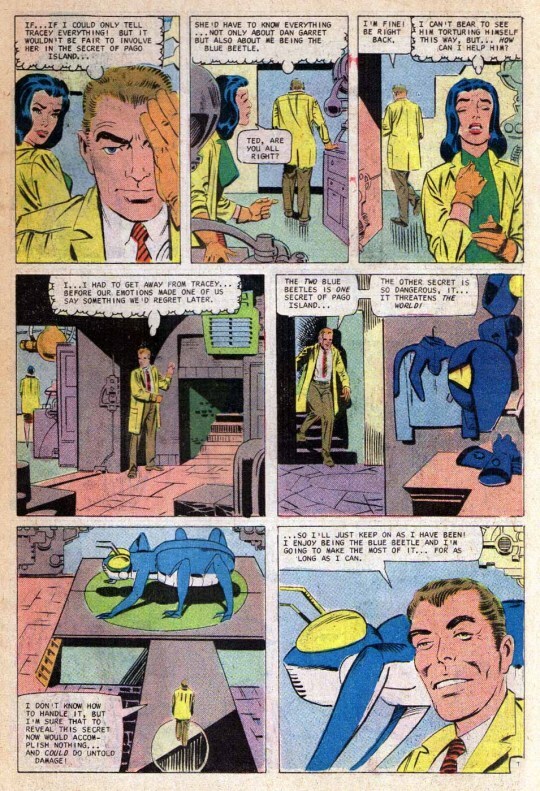 The Steve Ditko Blue Beetle was the most direct follow-up he ever did to his work on Spider-Man, and even though I hadn’t yet read Ditko’s Spider-Man stories, I found it incredibly appealing. It had color, mystery, character and movement–a seriously great strip that was foredoomed by Charlton’s crummy distribution and one-foot-out-of-bed approach tot eh whole concept of doing super hero titles. The Blue Beetle was scientist Ted Kord, who, for mysterious reasons, donned a costume and used high-tech hardware to police the city as a costumed crime-fighter. 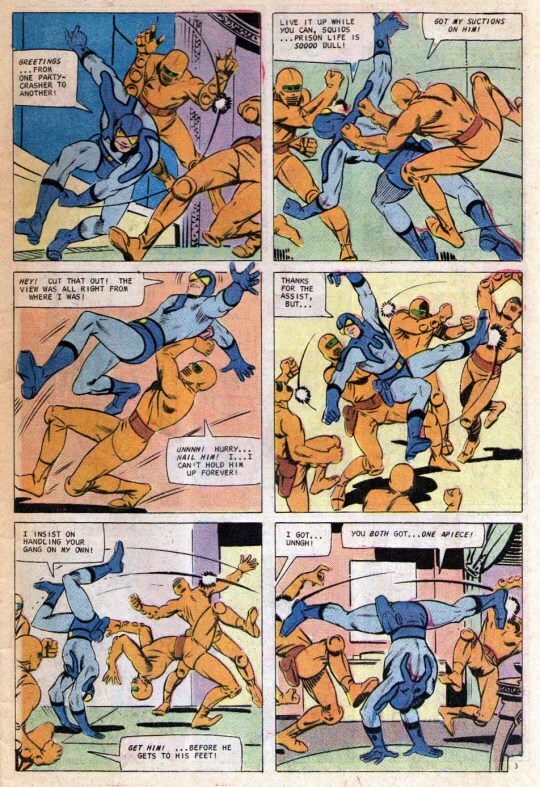 His predecessor as the Blue Beetle, Dan Garrett, was missing and presumed dead–and a police detective was convinced that Kord was involved in is murder in some way. Kord’s secretary and assistant Tracy had her own suspicions about her boss as well, and was poking around in his affairs when she wasn’t working. 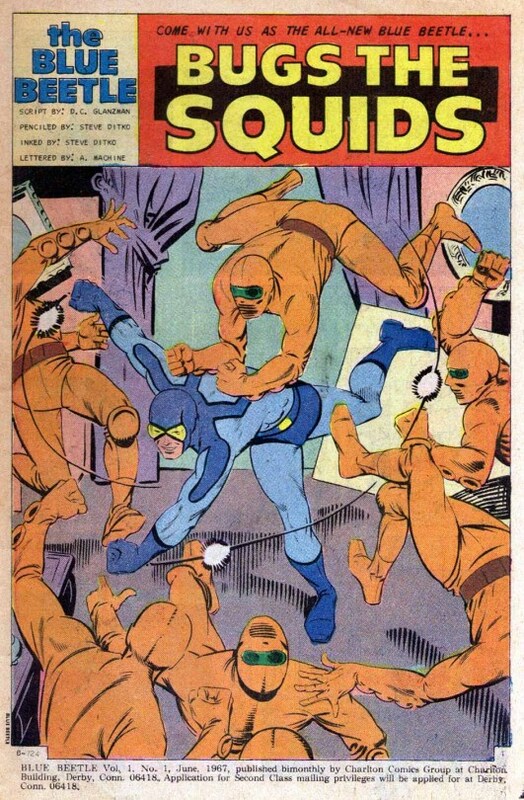 This particular issue opens with the Squid Gang, whose costumes include scuba gear and who can climb up the sides of buildings with built-in suction cups, on a crime wave through the city. One of the strange cost-saving measures that Charlton employed some of the time was to typeset its comics with a machine rather than hand-lettering. This particular issue was lettered that way, and it gives everything a sterile flavor. Anyway, the Beetle interrupts the Squid Gang’s next job, but they’re able to elude him. So it’s back to base and the problems of Ted Kord, including the suspicions of Detective Fisher and the anguish of concealing secrets from Tracy. What did happen on the mysterious Pago Island? I wouldn’t find out for more than a decade myself. Meanwhile, we learn that the leader of the Squid Gang is actually supposedly-wealthy Todd Van III, who had squandered his inherited wealth and was now hitting his social circle in daring robberies in order to maintain his high society lifestyle. He hosts a costume gala on his private yacht, then leave a confederate in place in his costume so that he and the rest of the Squids can board the boat and hold up the wealthy guests. The Squids appear to make off with their loot, but in actuality, they remain on the yacht. But the Beetle-Ship’s antennae are able to pick up the police calls concerning the robbery and the fact that the Squid Gang has disappeared. 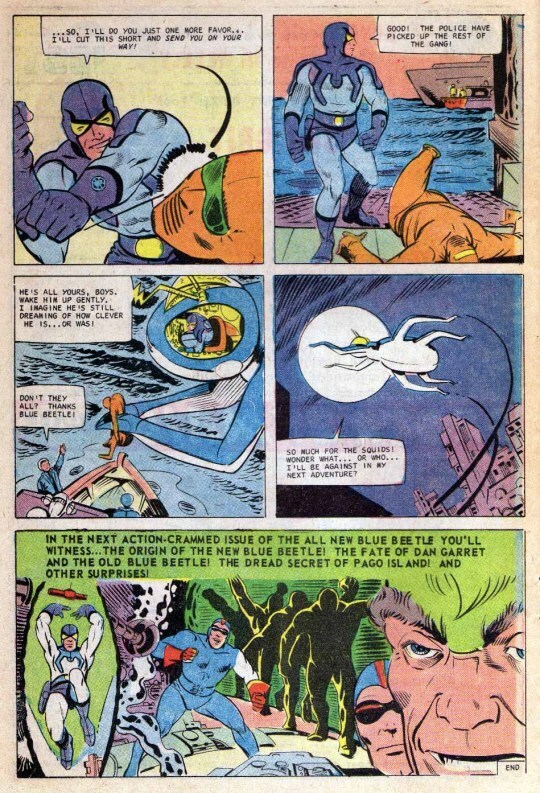 The Beetle lands on the yacht, intending to investigate, stumbles over the concealed Squids, and another frantic running Ditko fight sequence breaks out. The Beetle is outnumbered and outgunned until he remote-controls his flying Beetle-ship, the Bug, into the fray. Todd Van II intends to bow up the yacht, his men and all, and then retire back to his life of ease. But the Squids find him in the process of setting the explosives and abandon ship. Van runs, but it isn’t long before the Beetle is upon him, and he clobbers the high-class criminal in a few short punches, ending the story somewhat abruptly. 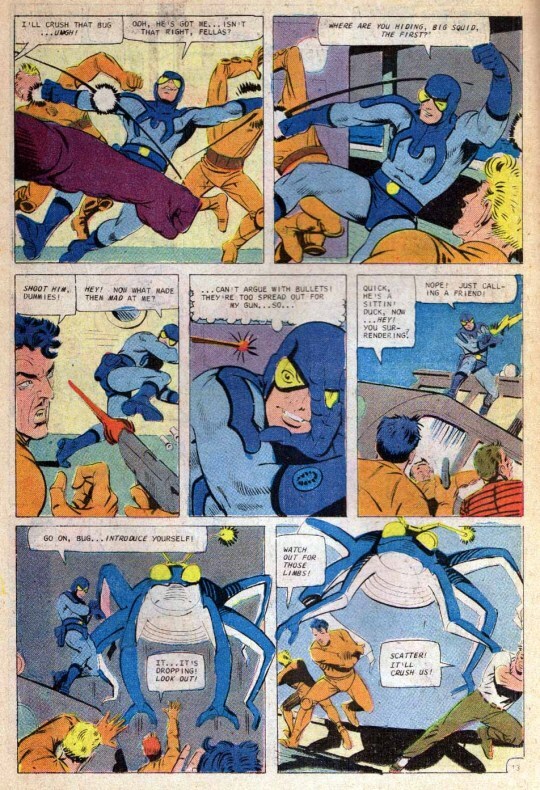 The final panel in the story teased that the next issue, #2, would reveal the truth about the origin of the Blue Beetle and what happened to Dan Garrett, but unfortunately, for whatever reason, Modern Comics never reissued that issue, so I wouldn’t learn the truth until I was able to track it down as a back issue many years later. 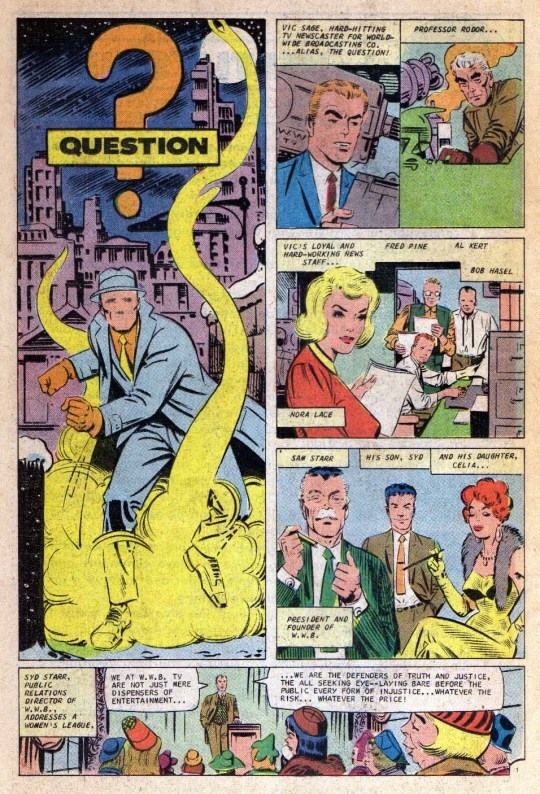 The back-up story was the very first appearance of the Question, one of Ditko’s signature characters–a more mainstream-appropriate incarnation of his self-published Mr. A, who embodied the Randian philosophies that Ditko himself had adopted. The Question wasn’t a super hero per se, but more of a vigilante investigator in the mold of the Spirit. In daily life, he was news broadcaster Vic Sage, who was uncompromisingly dedicated to the truth at all costs, and would not compromise on his principles. But when a little bit of outside-the-law investigation was called for, he’d adopt the guise of the Question. As this is the first Question story, the plot is relatively basic, with Sage trying to get the goods on a gambling ring that turns out to have ties to his own network, which presents itself as a tireless public servant but is actually compromised to self-interest. 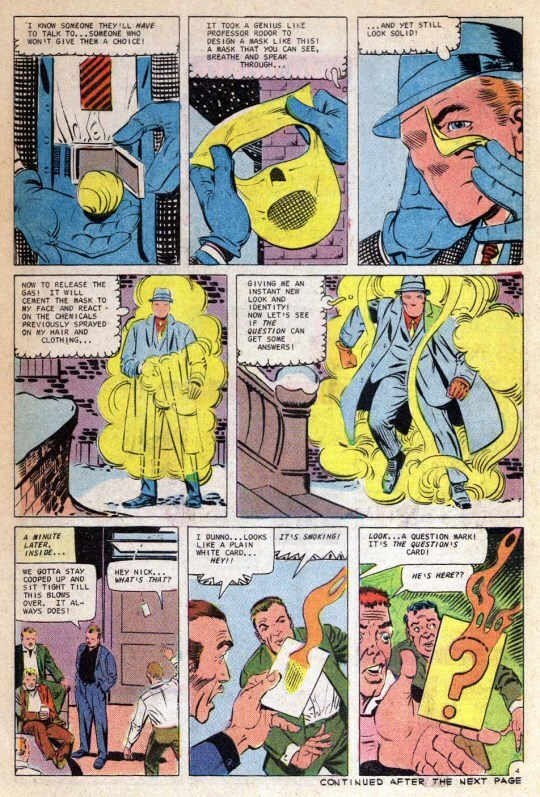 The one thing the story does do well, being the first, is to lay out all of the Questions paraphernalia–his one-piece faceless mask, the gas that transforms his clothes and hair, and the signature calling card he uses. While I didn’t love him as much as I did the less didactic Blue Beetle, I found the Question pretty fascinating.